Okay, I guess I'm technically supposed to start at the end of March. So I'm running a little late, but it's still early April and it's been a cold March. And a cold start to April too. Heck, just a few days ago it was still in the 20s and 30s. Though I'm not sure if it's still on the blog since I transitioned to blogger, but last year I got an offer from Hometown Seeds to give there seeds a try. I am getting the seeds for free for writing about them on my blog. So yes, you may want to take what I write with a grain of salt because even if I intend to write objectively, chances are unbeknown to myself, I'll be cutting them a break. I just wanted to get that out there upfront. Anyway,while I begin with seeding my flats tomorrow, it'll be a while until I actually can plant anything. And I mean beyond the obvious fact that this is Cleveland and you really don't plant until Memorial Day weekend. 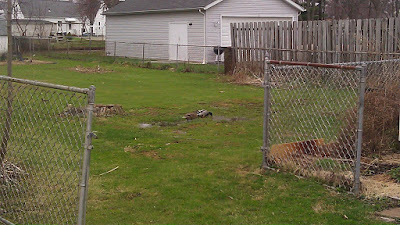 But more specifically because the backyard is more like a pond or a swamp than a backyard at this point. With the amount of snow and rain we've had this year it's been particularly bad. It's been so bad that some local ducks got confused! Tomorrow I'll need to make an inventory of the seeds I have and remeasure the yard to make sure I plan it out better this year. I did a poor job of it last year so I need to do a better job of planning it out this year.